Potrzebowska, K., Lehtonen, J., Samuelsson, M. and Svensson, L. (2018). Flow Cytometry Assay for Recycling of LFA-1 in T-lymphocytes. Bio-protocol 8(23): e3104. DOI: 10.21769/BioProtoc.3104. To enable cells to move forward, cell surface integrins are internalized into an endosomal compartment and subsequently intracellularly transported to be re-exposed at a new site on the cell membrane. Leukocytes are the fastest migrating cell type in the human body, which express the leukocyte-specific integrin LFA-1. 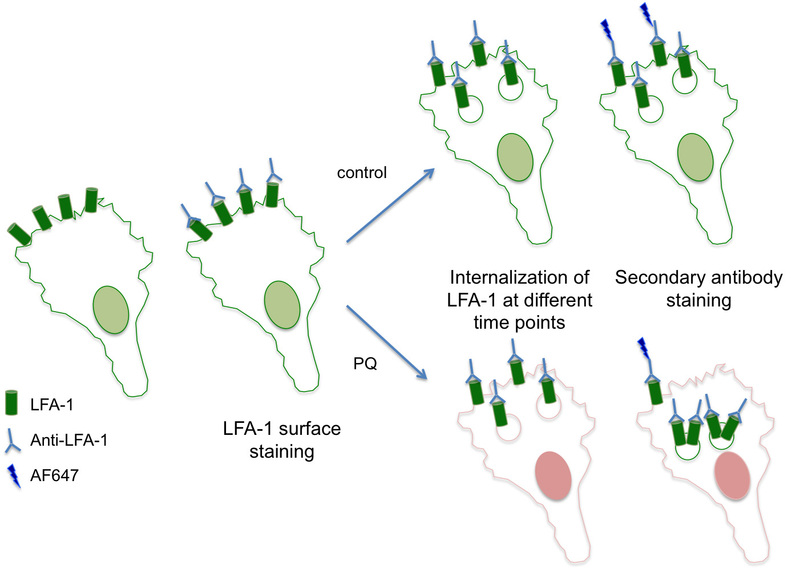 Here, we describe a flow cytometry-based assay that allows the quantification of LFA-1 internalization and its re-expression on the cell surface in T lymphocytes. An advantage of using flow cytometry-based assay over biochemical methods is the low number of needed cells. This protocol can be also used to measure recycling of other receptors. Leukocytes need to be quick to extravasate from the vascular in order to defeat invading pathogens. To become effector cells, T lymphocytes need to migrate in the lymph nodes where they can encounter their specific antigen (Ley et al., 2007). LFA-1, which is the major integrin used by T lymphocytes to adhere and migrate, binds to its ligand intercellular adhesion molecule-1 (ICAM-1) on the endothelial or the antigen presenting cell (Evans et al., 2009). The reuse of LFA-1 is a dynamic process as it is internalized and intracellularly transported to be re-exposed to a new sight on the cell membrane for the cell to move forward (Svensson et al., 2012). The lysosomotropic amine Primaquine can be used to block intracellular transport and when used in T cells LFA-1 dependent migration is impaired (Stanley et al., 2012). The exact mechanism how LFA-1 is internalized and recycled isn’t fully understood. One method to investigate the internalization and re-exposure of LFA-1 in low number of cells is to label cells with the non-blocking antibody for LFA-1 (TS-2) and analyze the internalization and re-exposure of LFA-1 at different time points by flow cytometry (Samuelsson et al., 2017). Take 3.4 x 107 cells and wash in 15 ml ice cold HBSS wash buffer (Recipe 1). Centrifuge at 300 x g for 10 min at 4 °C. Remove 1 x 106 cells for unstained control and fix these in 200 μl 3% PFA in migration buffer (Recipe 2) for 20 min on ice and wash in 1 ml ice cold migration buffer twice and resuspend in 200 μl ice cold 2% FBS in PBS and store until analysis at 4 °C. Resuspend 3.3 x 107 cells (Note 2) in 1 ml of ice cold 10 μg/ml TS2/4.1.1 antibody in migration buffer. Wash once with 10 ml ice cold migration buffer. Resuspend in 6 ml ice cold migration buffer and keep on ice until being used. Take 1 ml of TS2-stained cells and divide into 3 microcentrifuge tubes (330 μl cells/tube) and add 0 μl from freshly made 30 mM PQ (Note 3) to one tube (control, 0 μM PQ) and 1.1 μl PQ to the second tube (100 μM PQ) and finally 3.3 μl PQ to the third tube (300 μM PQ). Take 110 μl into each well in a 96-well plate from each condition in Step B1 to make triplicates for time point 150 min and incubate for 30 min at 37 °C. Note: We repeat this procedure for the 120 min, 90 min, 60 min, 30 min, and 0 min time-points. Two minutes before each time point (Note 4), we prepare the PQ samples as described in Step B1. Precisely at the time points we take out the 96-well plate and add 110 μl into each well to make triplicates. The 96-well plate is returned to the 37 °C incubator after each step. After final incubation take out the 96-well plate and put on ice and add the last triplicates (110 μl/well) for the 0 min time point. Add 100 μl of ice cold migration buffer into all wells and centrifuge the plate at 300 x g, 4 °C for 2 min. Resuspend cells in ice cold 2 μg/ml donkey anti-ms-AF647 in ice cold migration buffer with 0.1% BSA for 20 μl/sample. Wash twice each with 200 μl ice cold migration buffer and centrifuge the plate at 300 x g, 4 °C for 2 min. Fix cell with 3% PFA in ice cold migration buffer for 20 min at 4 °C. Resuspend in 200 μl 2% FBS in PBS and transfer to FACS tube. Analyze samples using flow cytometry or store at 4 °C until analysis. For flow cytometry analysis, collect 30,000 gated events using FSC-A and SSC-A to avoid dead cells for each sample. Cells are then analyzed by using FSC-A and FSC-H to gate for single cells and then FL-4 to create histograms for the different time points and calculate Mean Fluorescence Intensity (MFI). To remove background from all samples subtract the MFI from unstained cells and calculate the mean of triplicates from each time point and condition. Relative % of surface expression = Divide the mean of the given time point by the mean of time point 0. As integrins first internalize you will first see a reduction and then after some time a re-exposure of integrins on the surface. In the samples treated with PQ the re-exposure will be lower compared to non-treated cells (see Figure 2 for an example). Take 6 x 105 cells per sample and use in triplicate for each time point. So for one condition with 6-time points, the total amount of the cells is 6 x 105 x 3 x 6 = 1.08 x 107 cells. Make a fresh 30 mM stock of Primaquine diphosphate (PQ) in PBS (= 13.86 mg/ml). To prepare the next step, you need more or less 2 min to prepare. And you need to adjust this time to suit you. Here you can use a new 96-well plate for each time point and adjust time and use 2 plate centrifuges if you want to avoid taking out and in the plates from the incubator. The protocol was adapted from Samuelsson et al. (2017). This work was supported by Swedish Research Council awards K2010-80P-21592-01-4 and K2010-80X-215917-01-4, Foundation Olle Engquist Byggmästare, I&A Lundberg Research Foundation, Royal Swedish Academy of science, Royal Physiographic Society of Lund, Åke Wiberg, Jeanssons Foundation, Kocks Foundation, P&U Schybergs Foundation, Gyllenstiernska Krapperup Foundation, Gustav V 80 Jubilee Fund, Österlund Foundation, Nanna Svartz and Crafoord awards (to LS). Anna-Greta Crafoord postdoctoral fellowship and Royal Physiographic Society of Lund (KP) and Royal Physiographic Society of Lund (MS). Evans, R., Patzak, I., Svensson, L., De Filippo, K., Jones, K., McDowall, A. and Hogg, N. (2009). Integrins in immunity. J Cell Sci 122(Pt 2): 215-225. Ley, K., Laudanna, C., Cybulsky, M. I. and Nourshargh, S. (2007). Getting to the site of inflammation: the leukocyte adhesion cascade updated. Nat Rev Immunol 7(9): 678-689. Samuelsson, M., Potrzebowska, K., Lehtonen, J., Beech, J. P., Skorova, E., Uronen-Hansson, H. and Svensson, L. (2017). RhoB controls the Rab11-mediated recycling and surface reappearance of LFA-1 in migrating T lymphocytes. Sci Signal 10(509) pii: eaai8629. Stanley, P., Tooze, S. and Hogg, N. (2012). A role for Rap2 in recycling the extended conformation of LFA-1 during T cell migration. Biol Open 1(11): 1161-1168. Svensson, L., Stanley, P., Willenbrock, F. and Hogg, N. (2012). The Galphaq/11 proteins contribute to T lymphocyte migration by promoting turnover of integrin LFA-1 through recycling. PLoS One 7(6): e38517. How to cite: Potrzebowska, K., Lehtonen, J., Samuelsson, M. and Svensson, L. (2018). 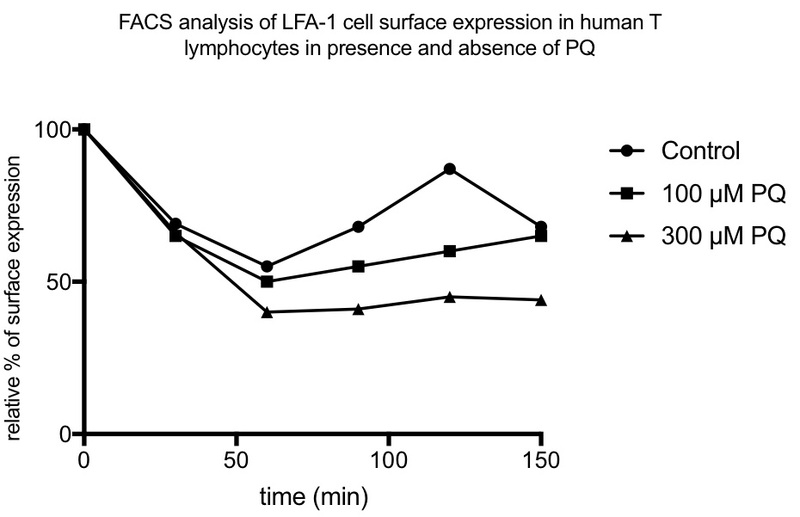 Flow Cytometry Assay for Recycling of LFA-1 in T-lymphocytes. Bio-protocol 8(23): e3104. DOI: 10.21769/BioProtoc.3104.